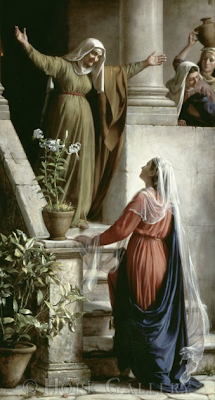 One of the most beautiful images of Elizabeth's joyful greeting of Mary. This painting is technically (composition, color, content and craftsmanship) wonderful and I am inspired by the moment he chose to paint. I wish I could see all his paintings in person but I have only seen one. (Healing at the Pool of Bethesda 111" x 126") Its size is majestic and the paint quality amazing. I wish to paint like that. Go to Hope Gallery for more information on this and other Carl Bloch paintings. Merry Christmas. It really is a spactacular painting, I love how he portrays age. Thanks for stopping by my blog. I do check on your blog from time to time. I can't wait to see your latest.